I have to let you know that we are absolutely gob-smacked with this new version of the Sims. The graphics, detail and game play are fab. You can loose yourself for hours in a virtual world that is fascinatingly realistic and in real time too ! No more does your Sim loose connection with it’s surroundings, because you can stroll (or jog), cycle or taxi through your neighbourhood till your hearts content, completely immersed ! Last night we decided to play with the terrain tools (before we started on our house building) and what amazing scenes you can make. We used one of the existing neighbourhood houses and placed on a lot, then added some landscaping, vehicles, plants and shrubs and hey presto ! The great features here mean that your plants don’t have to be regimented, you can rotate and intermix plant types across the grid squares which makes the whole scene more realistic. Elaine usually get’s lost designing houses, customising and decorating them, never mind creating Sim’s. 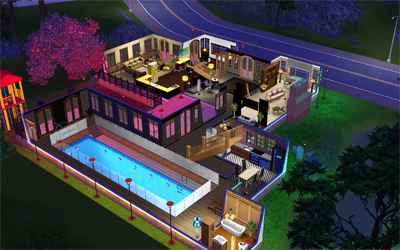 While I prefer to work my way up through the skills categories and job prospects and then build my Sim’s “perfect” house ! Look what we’ve created for our lucky Sim’s so far – we even managed a video ! As for gameplay, we were running our game with everything just about up to the max on a screen size of 1920 x 1200. Wow! Those houses are amazing! So… is there any chance those would be put on thesims3.com? If so notify me because those are some gorgeous houses! I’m truthfully not a house-making person because I take simply forever to get one finished so downloading those would be fab! 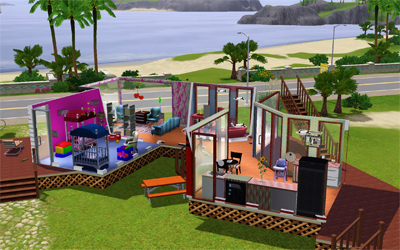 Anyways thanks for the wonderful article and visit my page if you like The Sims 3 that much! 😉 Happy simming! The customisation features are brilliant Diane, wait till you see our room interiors – another post looming me thinks ! Hi Miss Plumbbob, the beach house is uploaded, I hope your Sim’s like it !